JH Global Services, Inc., a global outsourcing and distribution company whose mission was to seek opportunities and import and distribute products and/or services that were currently in demand in the marketplace started Star EV when they identified an opportunity in the golf and electric vehicle segment. Star EV was initially targeted towards the green movement and aging Baby Boomer generation. To date, Star EV currently offers more than 50 models and products that are in high demand in various industries. Golf Cars Unlimited can surely provide all your utility golf car solutions, so browse our wide range of low speed vehicles today. Feel free to drop us a line for any inquiries or concerns. The H-Series 48-2H is a modern cargo carrier with a seating capacity of 2 persons to cater to all your industrial and commercial needs. The car has an elegant design along with trendy features such as advanced signalling and stylish interiors which mean that you do not need to look archaic while carrying your cargo. A powerful engine and efficient battery system ensure that your cargo will always reach its destination ahead of time. The H-Series 48-4H is a modern carrier automobile that is equipped with state-of-the-art technology to ensure a safe and timely passage for your cargo. The car has ample seating space with a capacity of 4 persons to accompany your precious cargo. Technologically advanced features such as a speed selection switch and a voltage reducer for your accessories mean that your travel need not be an experience devoid of fun and entertainment. The H-Series Classic 48-6H is a carrier automobile designed by Star EV and equipped with modern features to enhance your cargo carrying experience. The car has ample capacity for 6 persons to be seated comfortably as also a wide cargo box to fulfil your cargo volume requirements. Its powerful 5.5 HP advanced DC motor allows it to easily carry heavy loads without compromising on its speed or manoeuvrability. With the H-Series Classic 48-6H, you can now carry your cargo in style and with the ease of your weekend shopping trip. The H-Series Classic 48-2HCX is a revolution in the field of cargo carriers. Its ultra modern looks and vibrant colours can be deceiving, but the carrier is no delicate vehicle. The 2-seater vehicle comes with a powerful engine and technologically advanced features that allow it to carry heavy loads with extreme ease. The H-Series Classic 48-2HCX is largely customizable and comes with the option of a dumping utility box, an enclosed shelving box as well as a flat bed or stake box. The H-Series Classic 48-4HCX is a gracefully yet sturdily built carrier with a seating capacity of 4 persons. The stylish and technologically advanced features provide for easy handling of the vehicle as well as the cargo. Apart from a powerful engine and a voluminous cargo capacity, it comes with a multitude of upgrades such as rust-proof chassis treatment, enclosure, extended roof as well as an AC upgrade to enhance your transport experience. Transporting your cargo will never be the same again. The C-Series AC48-2-AC-UB-L-D is a tough yet stylishly built cargo carrier that comes in trendy vibrant colours and a powerful 7 HP AC motor that helps you cruise along with a heavy load of up to 1100 lbs. The car has lockable doors to ensure the safety of your accessories and also comes with option of two bed lengths as per your cargo preferences. The car is truly built to satisfy all of your industrial cargo carrier demands. The C-Series AC48-2-AC-UB-S-D is a modern 2-seater cargo carrier with a 7 HP AC motor and a 48V battery system that allows you to reach top speeds of around 20 mph. The carrier has a sufficiently large cargo capacity of 550 lbs and comes with handy upgrades such as an aluminium ladder rack and a Lester on-board charger. The Curtis Controller and regenerative braking capability provide you with a comfortable and safe ride. The AK-Series AK48-2-STD-BC and AK-Series AK48-2-STD-BC-D cargo carriers are sturdily built with top-of-the-line technology and a powerful 6.8 HP AC motor. The utility trucks come equipped with a complete entertainment system with a deluxe stereo, CD player and 2 speakers. As if this wasn’t good enough, the carriers have a mammoth towing capacity of 3000 lbs as well as a sufficient capacity to transport your industrial cargo. The AK-Series AK48-2-STD-2TB and AK-Series AK48-2-STD-2TB-D are industrial carts that are sturdily and spaciously built with an amazing towing capability of 4000 lbs due to its powerful 6.8 HP motor. The carriers come with technologically advanced upgrade options such as a 2” towing receiver, AGM batteries and a heavy duty Sunbrella enclosure to ensure that cargo carrying does not become a tedious job. The AK-Series AK48-2-LONG-2TB and AK-Series AK48-2-LONG-2TB-D are industrial grade carrier carts with a modern and sturdy built as well as a 6.8 HP powerful AC motor. The carts come with a Curtis controller and a hydraulic braking system that enhances your driving experience while the spacious and comfortable bucket seats keep you from tiring out at the end of your transportation journey. The AK-Series AK48-2-STD-SB and AK-Series AK48-2-STD-SB-D are industrial grade commercial utility trucks that are stylish, sturdy and spacious, all at the same time. The carriers come with a cargo capacity of 800 lbs and a towing capacity of 4000 lbs, the power provided by the mighty 6.8 HP AC motor. The trucks come with multiple upgrades such as strobe lights, AGM batteries as well as the option of a heater and a defroster. The AK-Series AK48-2-LONG-SB and AK-Series AK48-2-LONG-SB-D are commercial utility trucks with comfortable bucket seats and stylish interiors that complement their modern design. The mighty 6.8 HP AC motor provides the trucks with enough power to be able to tow a mammoth load of up to 4000 lbs individually. The large Stake Box provided in the rear as well as a cargo carrying capacity of 800 lbs make the trucks an ideal choice for cargo transportation. The AK-Series AK48-2-STD-EB and AK-Series AK48-2-STD-EB-D are 2-seater industrial cargo carriers built by Star EV with a large towing capacity of 3000 lbs. Along with the sturdy design of the two models; the carriers are also trendy with 12” aluminium wheels and an entertainment system with a deluxe stereo and CD player. The cargo box is spaciously built with a capacity of 660 lbs and is enclosed for that extra layer of safety. The AK-Series AK48-2-LONG-EB and AK-Series AK48-2-LONG-EB-D are commercial utility trucks that come with a powerful 6.8 HP AC motor and a 48V battery system that allow it to tow loads of up to 4000 lbs with a top speed of around 20 mph. The carriers come with options of two beds sizes as well as optional automotive-grade cab doors and extremely comfortable bucket seats, making your transport ride leisurely as well. The AK-Series AK48-4-EB and AK-Series AK48-4-EB-D are transport carriers with a seating capacity of 4 persons. The trucks have modern sturdy design with doors, stylish signal lighting as well as an enclosed cargo box with a capacity of 800 lbs. The powerful engine and advanced battery system allow them to reach speeds of 20 mph, which considering the passenger and cargo capacity, is an impressive feat. The AK-Series AK48-2-STD-UB and AK-Series AK48-2-STD-UB-D are industrial cargo carriers with a seating capacity of 2 persons. The compact built might belie their ultra modern specifications but they come with a smooth manoeuvring system and a powerful AC motor that allow them to tow a mammoth 3000 lbs cargo with ease. The transport ride is made extremely comfortable by the regenerative braking capability as well as the posh interiors. The AK-Series AK48-2-LONG-UB and AK-Series AK48-2-LONG-UB-D are commercial utility trucks that have a modern stylish design as well as technologically advanced specifications to cater to all of your cargo transportation needs. The trucks come with a mighty AC motor and a 48V battery system as well as the multiple upgrade options such as the heater, defroster and self-sealing tires which make your journey entirely hassle-free. The AK-Series AK48-4-UB and AK-Series AK48-4-UB-D are industrial cargo carriers built by Star EV with a stylish yet sturdy design and top-of-the-line technology. The carriers have a seating capacity of 4 persons as well as a cargo carrying capacity of 800 lbs, all of this made possible by the powerful 7 HP AC motor. The comfortable bucket seats and the stereo system make a ride in these trucks a fun and pleasurable experience. The Classic HD Series built by Star EV has been designed with the perfect golf automobile in mind. The stylish sturdy design and posh interiors along with a powerful engine, battery system and a passenger capacity of 2, 4 or 6 persons make the Classic HD Series a car that is extremely desirable. The car comes with a cargo capacity of 300 lbs so that you won’t have to leave your luggage behind the next time you travel. Quite the all-rounder indeed! The Classic HD Series – HD 48-2HCX is a modern sophisticated automobile that has a trendy sporty look to it as well. The car comes with a powerful engine and battery system that takes care of your driving needs with ease as well as multiple efficient upgrade options such as a lockable glove box, rust-proof chassis treatment and an all-weather Sunbrella enclosure that let you travel in style while ensuring your safety as well. The Classic HD Series – HD 48-4HCX is a spacious and sturdy 4-seater automobile that comes with a powerful 5.5 HP ADC motor and a top speed of around 20 mph. The car also has a cargo carrying capacity of 800 lbs making it the ideal vehicle when there are too many bags to carry. The Classic HD Series – HD 48-4HCX comes with multiple upgrades such as an AC system, windshield viper as well as an all-weather Sunbrella enclosure to ensure a fun and comfortable trip. The H-Series Sport 48-2H is a 2-seater car with a modern sporty look to it as well as a powerful 5.5 HP advanced DC motor. The car has stylish interiors along with a sturdy exterior build and trendy LED signalling system. The H-Series Sport 48-2H has a brush guard for enhanced safety along a clay basket at front and a cargo box at the back for all the cargo that you wish to carry with yourself. The H-Series Sport 48-4H is a spacious comfortable 4-seater automobile built by Star EV that comes with multiple upgrade options and a powerful engine and battery system. The sporty and modern design along with the Curtis controller, 12” steel wheels and regenerative braking capability allow it to manoeuvre through rugged terrain with ease while looking fashionable at the same time. The H-Series Sport 48-2HCX is a sporty automobile built by Star EV with a passenger capacity of 2 persons as well as a large cargo carrying capacity of 930 lbs. The car has a rugged sturdy design along with a powerful engine and battery system that allows it to cruise through all terrain easily. The H-Series Sport 48-2HCX has numerous upgrade options such as a clay basket and extended roof which add to its appeal as well as usability. The Classic 48-2HCX is an ultra modern vehicle built with technologically advanced specifications in mind. 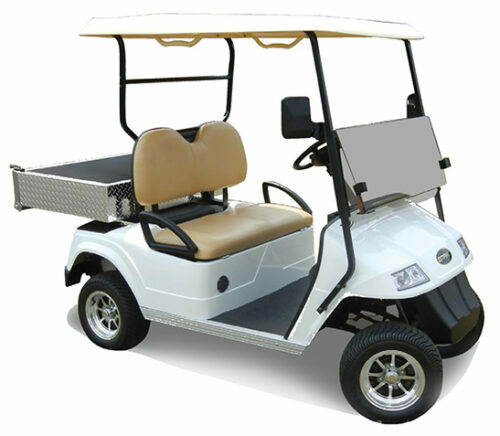 The 2-seater vehicle comes with a powerful motor and battery system, stylish interiors and exteriors as well as an insulated, rust-resistant beverage cart attachment for your travels during those hot sunny summers. The voluminous cargo capacity as well as the comfortable and spacious seating of the Classic 48-2HCX have given luxury an altogether new meaning. The U-Series 48U-HA1-DC-ADS and 72U-HA1-AC-ADS are 2-seater utility vehicles built by Star EV that come with a 6.7 HP DC motor as well as a 10 HP Ac motor option. The trucks are technologically advanced with a Curtis controller, an auto-drive forward and reverse system as well as a hydraulic braking system for hassle-free driving. The mammoth 2200 lbs load carrying capacity along with a fold-down tail box and a heavy duty bed liner mean that all your cargo worries will be addressed with a single solution. The U-Series 48U-2-DC-ADS is an industrial grade utility vehicle that is fitted with a mighty engine and an efficient battery system which provides it with an impressive 2200 lbs load carrying capacity. This 2-seater truck is technologically advanced with an automatic transmission system and comes in modern fashionable colours such as safety yellow, orange or white, which means that you will be attracting envious glances wherever you’re transporting your cargo in this stylish carrier. The U-Series 72U-2-AC is a mammoth 2-seater utility vehicle built by Star EV that comes with a beastly 10 HP AC motor and an impressive 72V battery system. The truck has an auto-drive system with forward and reverse drive capabilities along with hydraulic brakes that make for a comfortable and easy drive while its multiple upgrade options such as the beacon light and battery fill system add that extra appeal to your transport experience. The Classic 48-2 Police is a 2-seater patrol vehicle that is designed especially keeping in mind the requirements of the law enforcement officers. The car has a powerful 5.5 HP advanced DC motor and effective ground clearance along with stylish functional front and rear bumpers and 10” aluminium wheels which means that you can look fashionable and fight crime at the same time. The Classic 48-4-Police is a comfortably and spaciously built 4-seater patrol vehicle that is designed for law enforcement officers. The patrol vehicle has a powerful 5.5 HP advanced DC motor and a Curtis controller for easy manoeuvrability even in difficult terrain. The stylish design comes with an extended colour-matched roof and 10” aluminium wheels that allow the patrolling officers to make a fashion statement while they maintain law and order in the community. The AP48-04-Police and the AP48-04-D-Police are patrolling automobiles built with a sturdy frame and modern stylish looks. The 7 HP AC motor allows them to reach a top speed of around 20 mph while the add-on accessories such as the closable glove boxes, adjustable arm-rests and coil over shock front independent suspension make life a little bit easier for our brave law enforcement officers. The Diablo 2+2-Police and Diablo4+2-Police are patrol vehicles specifically designed for law enforcement officers by Star EV. The automobiles are fitted with state-of-the-art technology and features to enhance the law enforcement experience of the officers and to help them maintain law and order in the community. The sturdy aluminium chassis, the powerful engine, the excellent ground clearance and the numerous upgrades make it perfect vehicle for patrolling through any terrain. The Classic 48-2L-Ambulance is a medical emergency vehicle that is efficiently built with the latest upgrades and accessories. The ambulance comes with a powerful 5.5 HP advanced DC motor that helps it reach a top speed of around 20 mph so that you can always reach in time to help. The Classic 48-2L-Ambulance is equipped with a basic 74”x20” stretcher to help in times of medical emergencies. The AP48-04-Ambulance is a medical emergency vehicle designed by Star EV to carry patients comfortably and quickly. The spaciously built automobile has the capacity to carry 4 persons along with a standard stretcher attached. The ambulance has a powerful motor and a Curtis controller with regenerative braking for easy manoeuvrability. It also provides for an aluminium cargo box under the stretcher to keep your medical supplies handy in case of emergencies. The U-Series 48U-HA1-Ambulance and the 72U-HA1-Ambulance are medical emergency automobiles that are equipped with the latest technology such as a side passenger safety rail, a Wolo AG022 Polie PA system and LED rope lighting to help the medical team with their job. The powerful motor, the Curtis controller and the drive features make sure that the ambulance reaches the required destination well in time. You need a modern cargo carrier that is perfect for all your industrial and commercial needs. If you need a utility golf car that packs in a powerful engine, efficient battery system, different seating capacities and even different options in carrier capacities, then you should take a peek at Star EV’s H-Series models. It comes in five models: the H-Series 48-2H that can seat two and a cargo load capacity of 300lbs. ; the H-Series 48-4H that can seat four and a cargo load capacity of 300lbs. ; the H-Series Classic 48-6H that can seat six and a cargo load capacity of 300lbs. ; the H-Series Classic 48-2HCX that can seat two, a cargo load capacity of 600lbs., and a customizable carrier that offers the option of a dumping utility box, enclosed shelving box, or flat bed and stake box; and the H-Series Classic 48-4HCX that can seat four and cargo load capacity of 800lbs. You need a cargo carrier with a number of customizable features. Cargo carriers should be able to fit your hauling needs, so the option to customize a utility golf vehicle would always come in handy. Star EV’s C-Series gives you a number of options, such as the option of adding an aluminum ladder rack, Lester on-board charger, and custom rear box configurations – which can also come in two custom bed lengths to better fit your carrier demands. The C-Series is available in two two-seater models: the C-Series AC48-2-AC-UB-L-D that has a total cargo capacity of 1,100lbs., and the C-Series AC48-2-AC-UB-S-D that has a total cargo capacity of 550lbs. Both models run on a powerful 7HP AC motor, and 8x6V Trojan T-105 batteries. You need comfortable and technologically advanced industrial cargo carriers with large load and towing capacities. Star EV’s AK Series is your complete, all-in one-package industrial cargo carriers – incorporating a powerful engine, and massive load and towing capacities in a stylish and modern-designed utility golf car. The AK series comes in12 models, so one will surely fit your needs. You need a utility golf car that can also seat a number of passengers. If you need to transport people and luggage, then Star EV’s Classic HD series is for you. The Classic HD series is designed to be the perfect golf cart – from its stylish and sturdy design and frame, up to its powerful engine and battery system is perfect for you. It comes in three models, all with different passenger and cargo load capacities: the six-seater Classic HD series with 300lbs. cargo load capacity, the two-seater Classic HD Series – HD48-2HCX with 600lbs. cargo load capacity, and the four-seater Classic HD Series – HD48-4HCX with 1,290lbs. cargo load capacity. You prefer a sporty utility golf vehicle that offers a number of upgrades. Everyone loves upgrades and for those looking for such in a utility golf car would love Star EV’s H-Series Sport series. It comes in three models that all offer upgrades such as: an LSV (NEV) Street legal package, a tipping cargo box mechanism, amber strobe lights, AC system upgrade, 12” or 14” aluminum wheels, roof rack, and extended roof to cover box. You need a heavy-duty utility golf car. Star EV’s utility golf cars under the U-Series all come with powerful motor, massive cargo capacities, and technologically advanced features, such as a Curtis controller, an auto-drive forward and reverse system, and a hydraulic braking system. The U-Series come in four models: all having two-passenger seating and 2,200lbs. cargo load capacities. You need a utility golf vehicle that is specifically built for the security and healthcare industries. Star EV offers a number of utility golf vehicles that are built for the requirements of certain industries, such as law enforcement and healthcare. The Classic 48-2-Police, Classic 48-4-Police, AP48-04-Police, AP48-04-D-Police, Diablo 2+2-Police, and Diablo 4+2-Police are all built and designed especially for law enforcement. On the other hand, the Classic 48-2L-Ambulance, AP48-04-Ambulance, U-Series 48U-HA1-Ambulance, and 72U-HA1-Ambulance are medical emergency automobiles that are equipped with the latest technology needed for the provision of emergency health services. You need to haul and provide refreshments anytime, anywhere. Star EV’s Classic 48-2HCX Beverage Car is the ultimate refreshments stand with its 600 12oz can capacity storage box, six shelf areas, easily changeable billboard, locking drawer, and tinted glazing that can easily lock in cold and freshness.